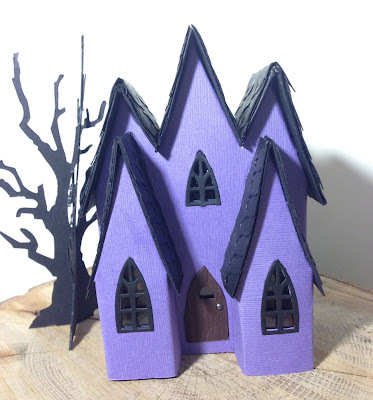 I decided to start this blog really because I am busy making lots of little Halloween cardboard houses to sell for the Head Start school we support for Christmas. I kept posting them on my “Green in Greenville” blog which is mostly about what I’ve done to make my home (and family member’s homes) more energy efficient. I am very serious about energy efficiency and conservation of resources so my crafty articles didn’t match very well with that blog. Hence the new crafty blog. I think it frees me up to be more creative on both blogs. So for my first post I am going to post some photos of the Halloween cardboard houses, I hope you enjoy them. I’ve named every house and I’ll give you a little background on each one. They are listed below in roughly the order that I made them. I’ve got a total of 20 houses, though I’m not posting all of those in this post. 3 Gable Gothic is the name of this house. 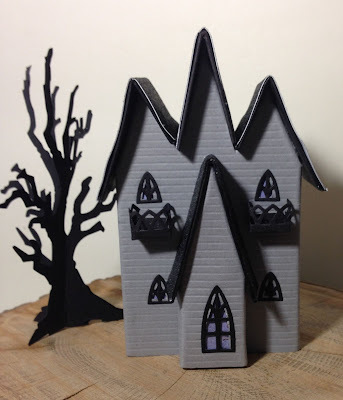 I wanted the gables to be elongated and kind of spooky. That is a Tim Holtz Sizzix die to make the spooky tree. I glued a half of the tree to the back so it would stand up. 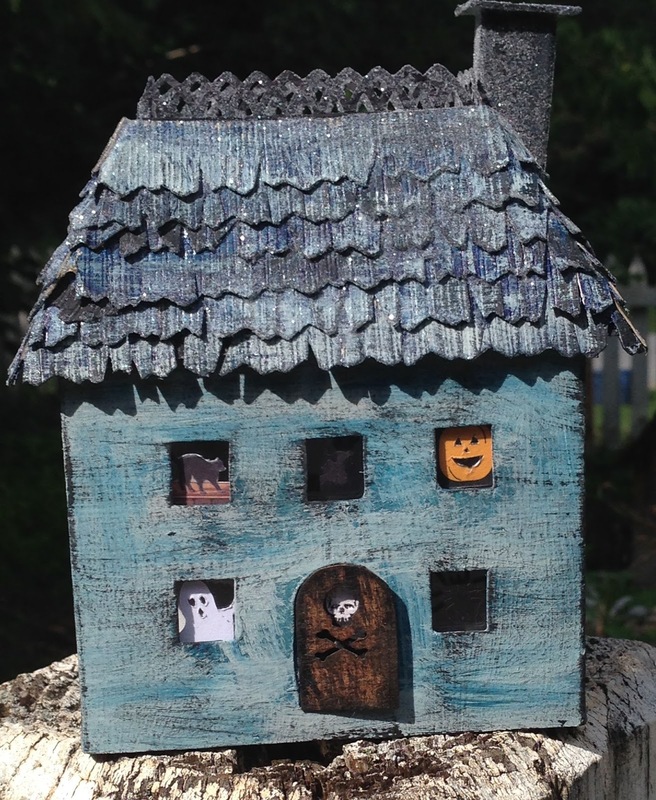 This house is not on a base yet or decorated with Halloween elements around the base. Really need to do that. 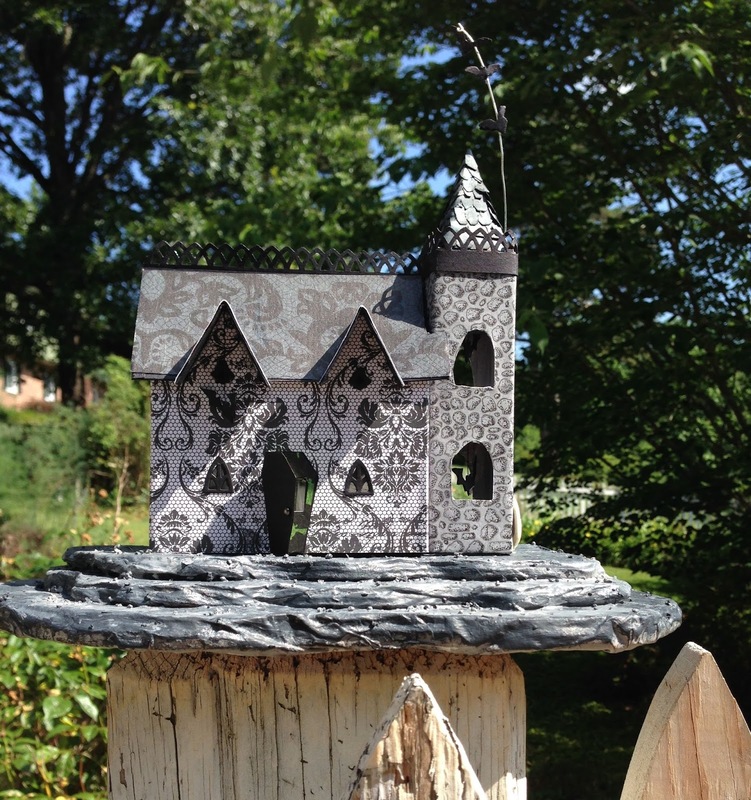 I call this house – 5 Gable Gothic. I think I did a much better job on the arches and the roof on this pattern. I like the arched windows too. This one also needs a base and decor. This house is just called the Green House. 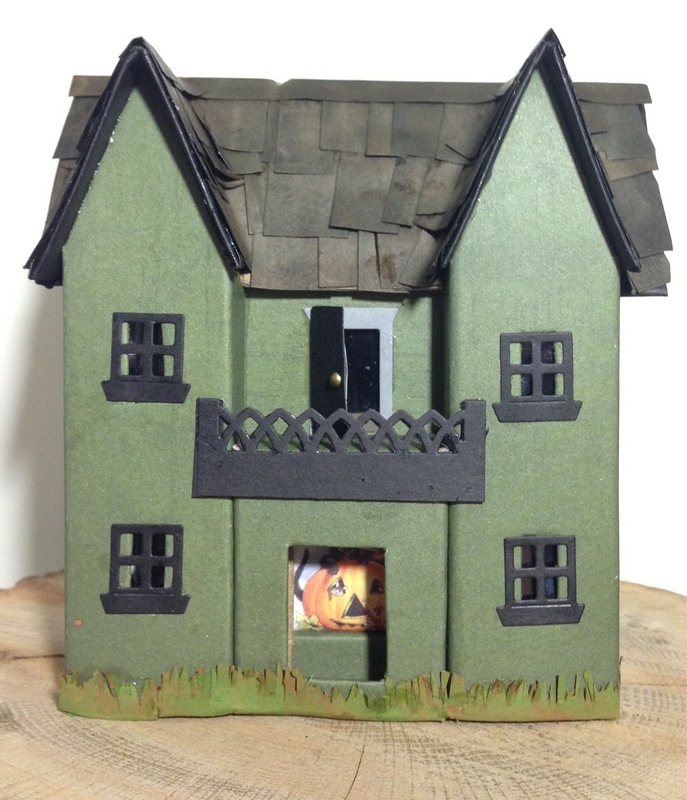 It’s based on a style of little cardboard houses called “Hacienda” houses. It’s another house that is not on a base or fully decorated which will make a huge difference in how it looks. 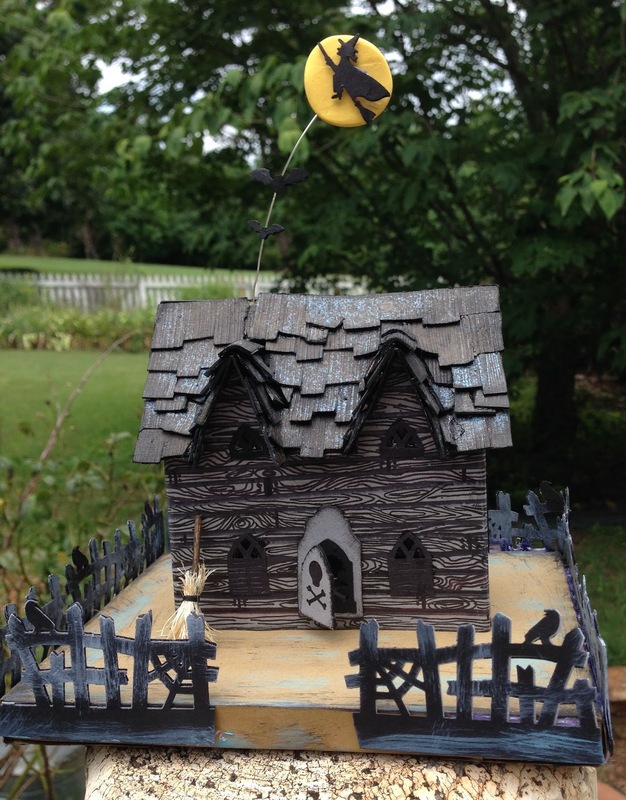 I call this the Flying Witch House. It is one of my favorites. 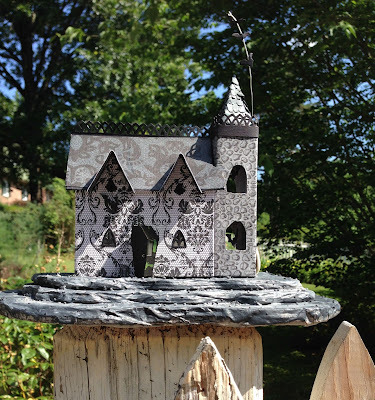 I really worked hard on the shingles and I hand drew the wood grain on the paper covering the house. The fence is a retired Martha Stewart punch that I really like. And the witch is also made from a retired Martha Stewart punch that I bought on ebay. My younger brother loves this house. 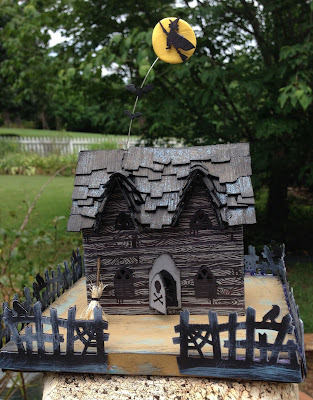 It is called the Flying Bat house because of the 6 bats that are dangling from the house. They are hard to see in the photo though. John loves this house because the door is in the shape of a coffin and he just thinks that is so cool. The Silhouette House is a very fun house because all of the windows and even the door have silhouettes in them that look great when light shines through them. I really like this house. 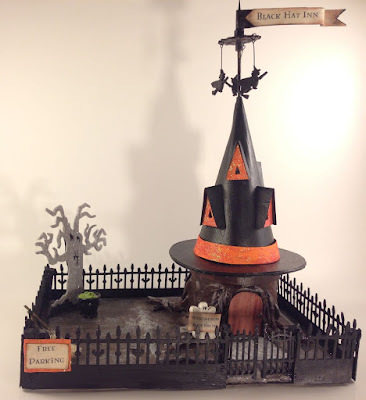 Again – gotta put it on a base and add some halloween decor. These next two are two of my better built houses as they are very sturdy. The one with the keys and locks is called Steampunk Key house. It is my artsy fartsy house according to John. 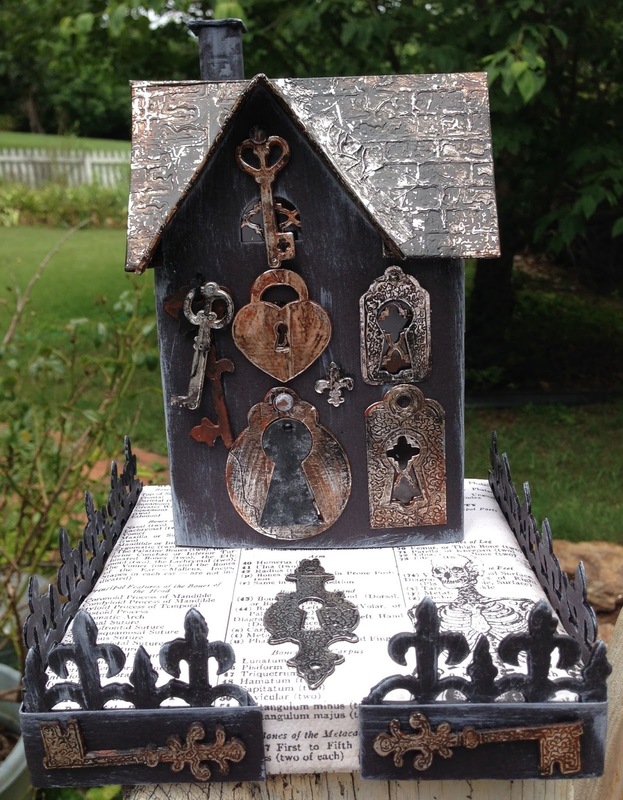 I worked really hard to make all the keys and locks and to make them look like rusted metal. Even the chimney has a keyhole shape as the opening. I also like the base. See how it completes the house. The house below it is called the Clockhouse on a Frosty morn. It is probably my prettiest house. The fence is really cool. 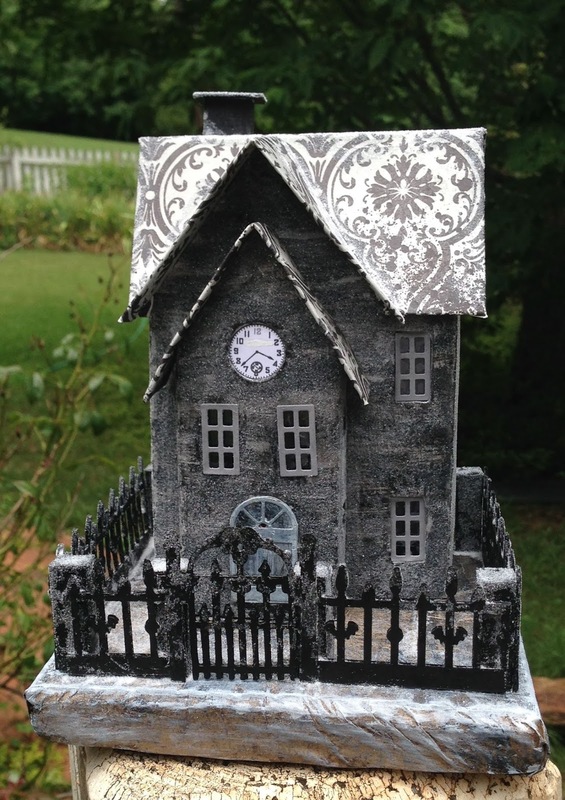 The fence is a combination of a Tim Holtz halloween fence and a retired Martha Stewart Halloween fence punch. I also made pillars to support the fence well. The last house I made is the “Black Hat Inn”. It has a lot of features that took a long time, but were very fun. The witches on top spin. The hat comes off so you can put an LED candle in there to shine through the triangular dormers. The base is made out of a cardboard cylinder and paper mache to look like tree roots. I made the spooky tree from a die from LaLa Land. I made a polymer clay cauldron and a ghost doorman. Free Parking refers to where the brooms may be parked. The fence is mostly the retired Martha Stewart fence with a Spellbinders (I think) gate. I actually have one other project I’ve completed, but I don’t have good photos. 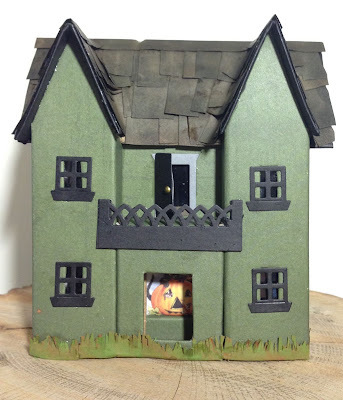 It is more like a diorama than a house per se. I will post this project when I have good photos. These are so amazing! I wish I could see them in person!